Egyptology: The Missing Millennium published by Okasha El Daly is an invaluable resource showing the extent of efforts by Muslims to study and develop knowledge inherited from prior generations. In this book, El-Daly explores the varying areas of Egyptology in which Arab and Muslim scholars made profound discoveries while attempting to understand and conceptualise Egyptian culture and science. He analyses a number of works created by Arabic writers on Egyptian practices, providing proof of the unending interest in Egyptology by Muslims, invalidating the wide-spread idea that Muslims did not value pre-Islamic cultures and traditions. Review of Egyptology: The Missing Millennium, Ancient Egypt in Medieval Arabic Writings, by Okasha El Daly. London: UCL Press, 2005. Paperback: 230 pages; ISBN-10: 1844720624 – ISBN-13: 978-1844720620. Dimensions: 9.1 × 6.1 × 0.7 inches. The contributions of the Islamic World to modern science have been a matter of discussion for a while now as different aspects of the studies and developments carried out by Muslims of the past have been covered and analysed in a number of texts. Through wide ranging publications and exhibitions carried out by various organisations including the FSTC, it is now commonly accepted that as Europe was living through its dark ages with little scientific development and social improvement, the Muslim world was using knowledge inherited from the past civilisations to prepare a more advanced future and find answers to questions that have existed in the minds of great scientists for centuries. A quantity of evidence showing the adaptation, improvement and effective implementation of Greek knowledge by Muslims from the late 8th Century onwards has come to light during the last few decades. These have been shown to have had a great impact on the continuance of science and the birth of the Renaissance and as a result have provided an alternative view to the general Eurocentric approach to the history of science. However, there are still certain aspects of the Muslim contributions that still need to be brought to clarity and researched further. One of these areas that has lacked in depth analysis was the contributions of Muslims in the field of Egyptology as the Muslim efforts to recover and utilise Egyptian knowledge and practice have been discounted by many who argue that with the spread of Islam and the resulting neglect by Muslims, Egyptian science and culture has been lost and left to die over time. Figure 1: Front cover of Egyptology: The Missing Millennium. Ancient Egypt in Medieval Arabic Writings by Okasha El Daly (London: UCL Press, 2005). The author systematically considers the historical approach taken to the study of Egyptology, discussing the currently held view held as well as the previous relevant works with the most recent being carried out in 2001, coming to the conclusion that no substantial work has been put forward analysing Ancient Egypt in the Arabic sources. He discusses in length the approach taken by Arabic writers to the study of Egyptology and how it differed from that of the Western approach. It can be seen that the Muslim observations from the time of first contact with Egypt through trading to the actual association were based on a sincere desire to get to know the culture and customs with major influences from the Qur'an and hadith which exhort appreciation of other nations and advice to establish relationships. The book also describes how Medieval Arab writers produced their works on Egypt through direct observation, discourses with Egyptian savants, classical sources, Jewish sources and other Arabic sources as well as giving background information on the topics discussed. Figure 3: Egyptian alphabet deciphered in Abu ‘l-Qasim al-'Iraqi's book Kitab al-Aqalim al-Sab'a. Source: Bibliothèque Nationale de France in Paris, MS arabe 2676, folio 18a; reproduced in O. El-Daly, Egyptology: The Missing Millennium, figure 23. Figure 4: Hieroghlyphic signs with their phonetic values below in a different colour in Abu al-Qasim al-'Iraqi Kitab al-Aqalim. Source: The British Library, MS Add 25724, folio 21b; reproduced in O. El-Daly, Egyptology: The Missing Millennium, figure 21. He also states the artistic and religious reasons for Arab interest in ancient scripts arguing that Muslim artists were greatly inspired by Egyptian art as well as by the monuments of ancient Egypt. Another significant topic covered by El Daly includes the Islamic attitude to ancient Egyptian religion with the temple domain, role of magic, superstitious beliefs, deities and prophets and a number of important pilgrimage sites like Heliopolis discussed at length and the suggestion that the Egyptian religion influenced the development of Sufism in Islam is put forward. Mummification and burial practices were also of great interest to Arabic scholars with accurate descriptions produced of the process and details of the potential medical uses of natural mummia identified. El Daly based his study on a large number of sources ranging from the accounts of travellers and geographers to accounts of treasure hunters and books of alchemy, most of which are of Arabic origin and some have been carefully translated into English. The figures provided in the final section of the book enable the reader to fully comprehend the extent of effort exerted by Muslim scholars to grasp the Egyptian language, culture and way of life with maps, drawings of observations, use of Egyptian hieroglyph alphabet and descriptions of findings. Further, the finely organised appendices with summaries of the biographies of Arab writers, books used by Al-Idrisi and the primary Arabic sources used by Dr El Daly himself are nearly as interesting as the main text and leave no question in the minds of the readers so as to the authenticity of El Daly's arguments. Figure 5: A stela of King Amenemhat II (ca 1928-1895 BCE) of the Twelfth Dynasty, as copied in Alu ‘l-Qasim al-Iraqi's Al-Aqalim. Source: The British Library, MS Add 25724, folio 50a; reproduced in El-Daly, Egyptology: The Missing Millennium, figure 24. Although the book covers a very specific discipline and is generally addressed to those closely interested in Egyptology and Arabic Studies, it nevertheless provides an excellent resource showing the unceasing attempts by Muslims to make use of the knowledge inherited from the pre-Islamic cultures. It is a worthy read and a positive contribution to the understanding of the Islamic approach to science and knowledge. Okasha El Daly graduated in Egyptology from Cairo University. He gained his PhD in the same field with a groundbreaking study which showed the contributions made by medieval Muslim Arabic scholars in the proper study of Ancient Egyptian civilisation. He has been a museum worker and university teacher for more than three decades and is based in the UK. After several years in University College in London, he is presently the Director of Projects at the Foundation for Science, Technology and Civilisation (FSTC) in Manchester. El Daly, Okasha, Egyptology: The Missing Millennium. 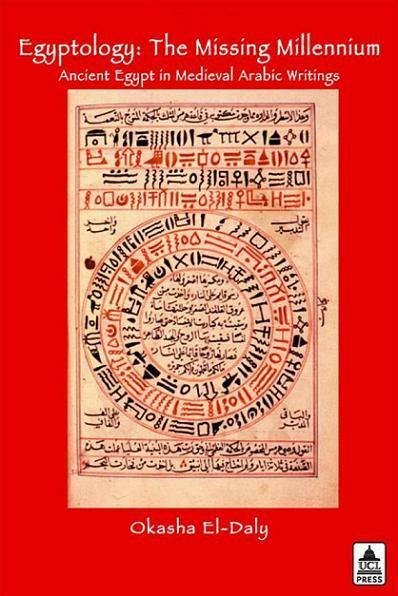 Ancient Egypt in Medieval Arabic Writings. London: UCL Press, 2005. Harcover, 230 pages, illustrated edition. El-Daly, Okasha: article on www.MuslimHeritage.com: "Deciphering Egyptian Hieroglyphs in Muslim Heritage"
The article surveys some results of Dr. Okasha El Daly's exciting discoveries about the precedence of Muslim scholars of the golden age of Islamic culture in deciphering the hieroglyphs of Ancient Egypt. This ground breaking achievement was attributed until recently exclusively to Europeans scholars, and especially to Champollion. El-Daly, Okasha: another article on www.MuslimHeritage.com: "Arabic Study of Ancient Egypt"
In this article, Dr Okasha El-Daly presents a glimpse into the richness of Arabic sources and the breadth and depth of Muslim scholars' interest in Ancient Egypt contrary to the widely held perceptions about Muslim lack of interest in the subject. El-Daly, Okasha, and Starkey, Janet, editors, Desert Travellers from Herodotus to T E Lawrence. Published by The Association for the Study of Travel in Egypt and the Near East, 2000, Paperback, 233 pp. The Leeds University Islamic Awareness Week organised by students invited Dr. Okasha El Daly to deliver the opening lecture on Monday 16th February 2009. Dr El-Daly, the Director of Projects of FSTC, lectured on "Muslim Heritage in Our World". He covered the sources of Islamic sciences and the interest Muslim scholars had in the ancient civilisations.